Usually making their first appearance in young adults from the ages of 15-22, wisdom teeth come in behind the back molars. It is important to remove wisdom teeth at an early stage of growth as they will eventually push their way in, possibly causing complications such as crowding and pain in other teeth. A lot of times patient’s mouths are too small to handle the 4 additional molars growing in, making the removal (or extraction) necessary. Removing the wisdom teeth as soon as possible is highly recommended. 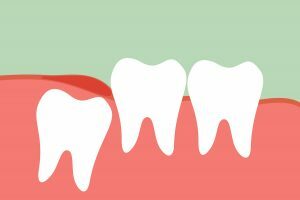 An early wisdom tooth extraction will not only minimize the pain of the procedure but will also make the chances of having an impacted tooth (which can destroy the second molar) almost slim to none. Our staff at ABC Dental Pediatric specializes in wisdom teeth removal for your teenager. Serving Peabody, Salem, Danvers and surrounding towns, if you have any questions about the procedure or would like to schedule an appointment with ABC Dental fill out the contact for or give us a call at (978) 532-2227!